Available for private lessons in woodcut printmaking and sumi-e painting. For the past two summers, I’ve been making prints at Denmark, and I will be showing most the them at this show. Explore the centuries old tradition of Japanese woodblock printmaking with master printmaker, Keiji Shinohara. Mr. Shinohara will share his inspirations and techniques for carving and printing. Afterward, visitors are encouraged to enjoy the exhibition, “Luxury on Paper: the Art of Surimono”, Room 278A with a new understanding of the artwork. This is a drop-in program. Come anytime and stay for as long as you would like. 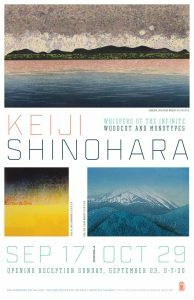 A demonstration and conversation with contemporary artist Keiji Shinohara exploring the world of woodblock printmaking, including his personal experiences (as an artist and student) and his views on historical changes in the art form. This program is part of the Contemporary Voices series of programsthat explore the wonders and challenges of the contemporary world with artists and other creative minds engaged in shaping the future. This exhibition marks the first time that Shinohara’s monotypes will be exhibited together in the United States.